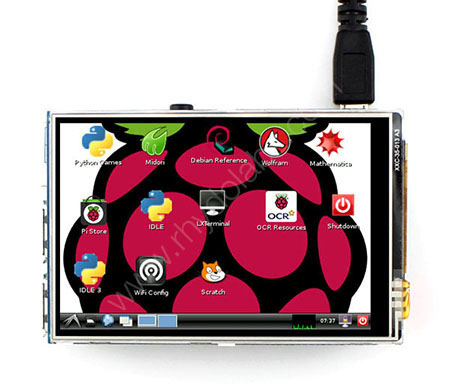 Description: Designed for Raspberry Pi Model B/B+, 3.5inch RPi LCD (A) is an ideal alternative solution for HDMI monitor. Combined with portable power this display module is the most convenient men-machine interface for Raspberry Pi. It supports Raspbian system, enabling your system to; play videos (supports multi formats, MP4 and so on) and take photos by touching (up to 17 camera modes). Also it supports software keyboard aiding system interaction without keyboard or mouse. It can be even used in your customized Raspbian system directly. 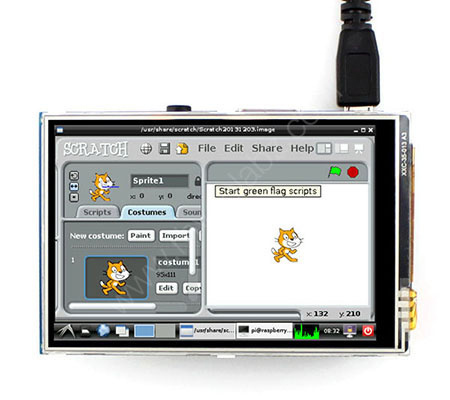 It provides a medium quality display for raspberry pi. Ideal for creating portable devices especially with Pi3 with built in WiFi. As I can install Retropie 3.7 on a 3.5 LCD screen ?? You can use the display with a Retropie running raspberry pi, provided you have the drivers. Can it work with raspberry pi 3? How do we use this 26 pin LCD with a 40 pin Raspberry pi 2? It can be directly plugged on to the Raspberry Pi. Make sure to use the first 26 pins of the Pi board. As per the datasheets available , it would supports any revision of Raspberry Pi (directly-pluggable). So it can be use with Pi Zero.